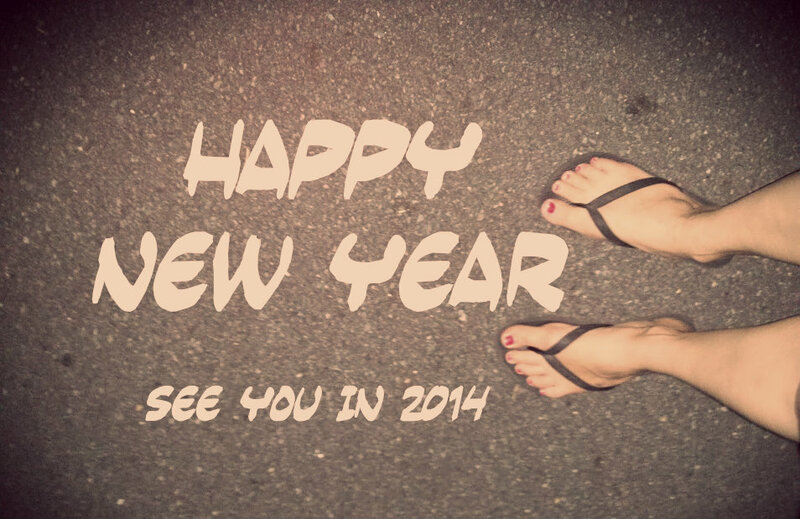 This year I was very fortunate to have my immediate family join us from Canada AND Korea. Last year, having just arrived, I was taken in by friends and had a seriously traditional Australian Christmas. We went to the beach. I got rocked in the surf. Cricket was played, seafood was eaten. I left to find a washroom and everyone thought I had been swallowed into the ocean and was presumed dead for a couple of minutes. I don’t think many people down here believe that people from Canada can swim. Although, can we, really? Yes, I know it’s just me likely, terrified of the ocean. 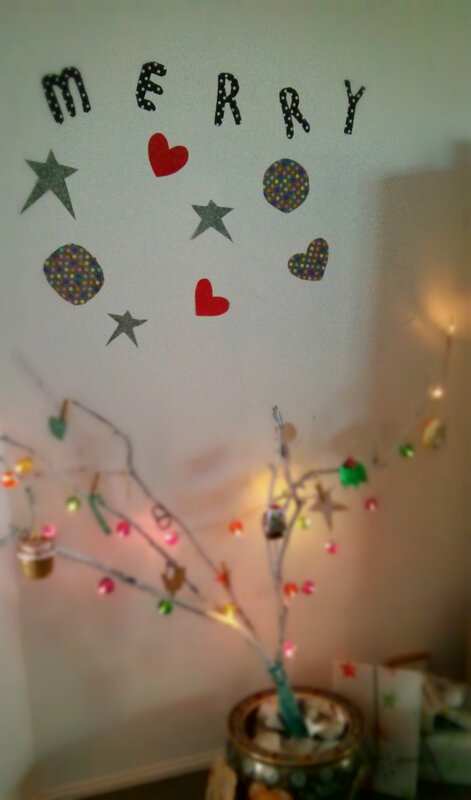 Anyway, this year, in our house, with our family – we discovered some new traditions. 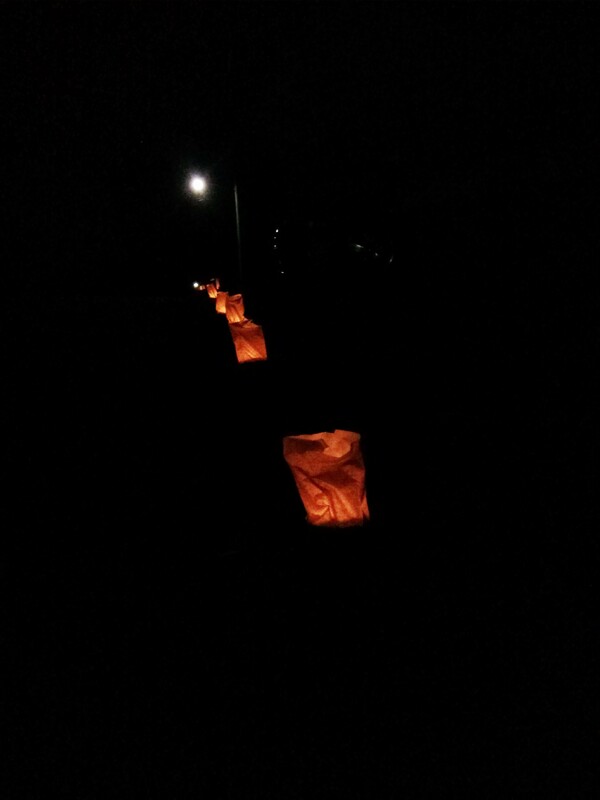 My favourite was the “luminaria” up and down our street: Apparently, a tradition in the American South West, Spain, and Australia … on Christmas eve, families set candles out (in our case, candles in paper bags lined with kitty litter/salt/sand or dirt) up and down the street. The tradition started as a representation of lighting the way for Mary and Joseph, enroute to give birth in a manger. NOT Santa trying to find the homes of good girls and boys (the theory of our family) … apparently, our community has quite an active church going community – which we found out after meeting our neighbours and some discussion about what they were doing. 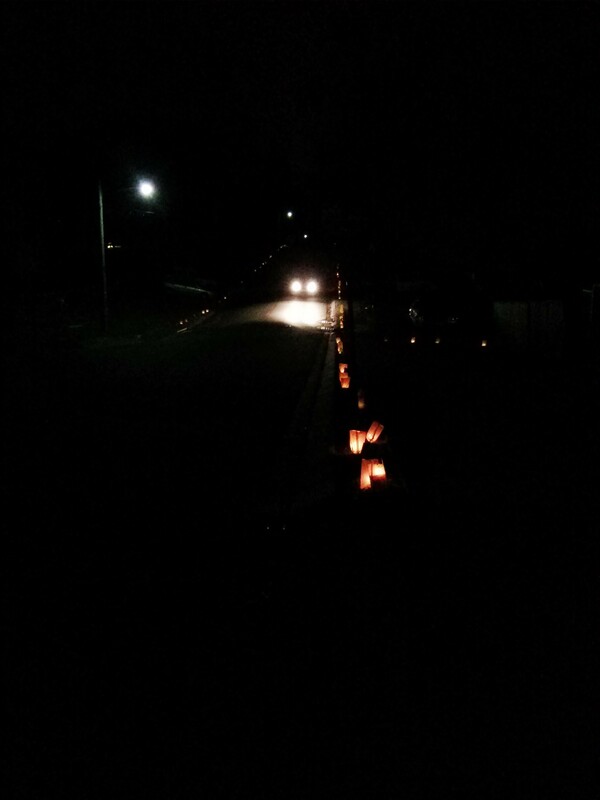 Prior to this, taking the dog for a walk – we found bags of sand with candles in them up and down the street. No one around, and no explanation. We thought we were missing something important. It was a great chance to meet our neighbours, and with the warm night, bats, possums birds and bugs – it created a very unique Christmas eve atmosphere. Maybe I’ll invest in a better camera next year. I wrote pretty extensively about this project on Kath or Kate – so click the link if you would like to learn more. We did see some “pine trees” for sale for 15 bucks outside the Salvation Army – however, I don’t think they were really pine trees – as they were more or less branches, but with needly leaves (and not dead). Finally – after a barbeque on Christmas day (it’s waaay too hot to cook inside) we went to see a movie at the mall on Boxing day (because it is also waaay to hot to do much of anything). Christmas is just the best. Our dog Arkie has had an interesting couple of months with the cane toads. 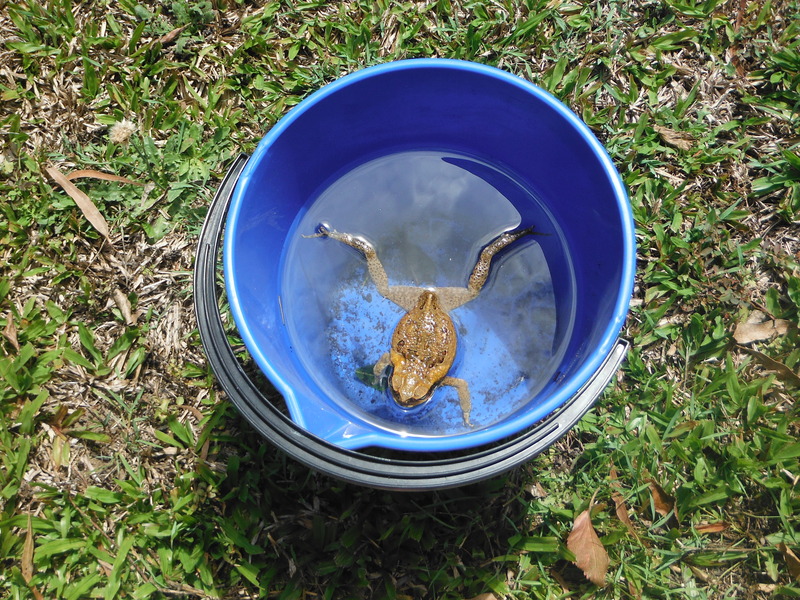 Cane toad in a bucket. My friends wouldn’t let me pick him up. The cane toad (Rhinella marinus) formerly Bufo marinus is an invasive species in Australia. The cane toad is the largest species in the family Bufonidae. Adult cane toads are usually heavy-built and weigh an average of up to 1.8 kg. 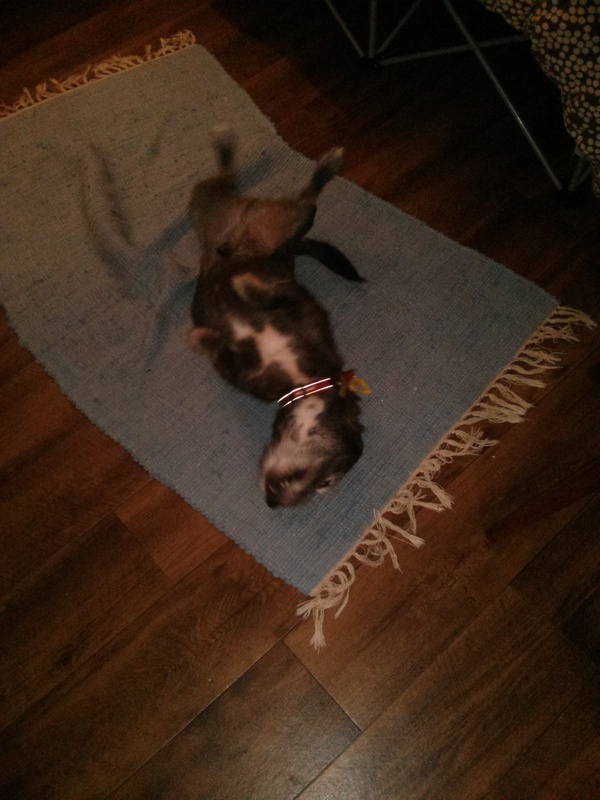 (4 lbs.). Their size may vary from 15–23 cm. (4-9 in.) and their skin is warty. The coloration on their back and sides may vary from olive-brown or reddish-brown, gray, and yellow while their bellies are semi-yellow or semi-white with darker mottling. Their body is round and flat, has prominent corneal crests, and light middorsal stripes. Their front feet are unwebbed, but their back feet have tough, leathery webbing. Cane toads have short legs and a ridged bony head that extends forward from their eyes to their nose. Behind their ears lie the parotid glands, which usually causes their head to appear swollen. These glands are used for defense against predators. The parotid gland produces milky toxic secretion or poison that is dangerous to many species. This venom primarily affects the functioning of the heart. Envenomation is painful, but is usually not fatal for humans.However, it does have some effects, such as burning of the eyes and hands, and skin irritation. Predators in Australia are not adapted to their toxin, which is the toad’s main defense mechanism. Because of this, toads don’t tend to hide and are usually targeted by predators, who then expose themselves to the toxic effects. 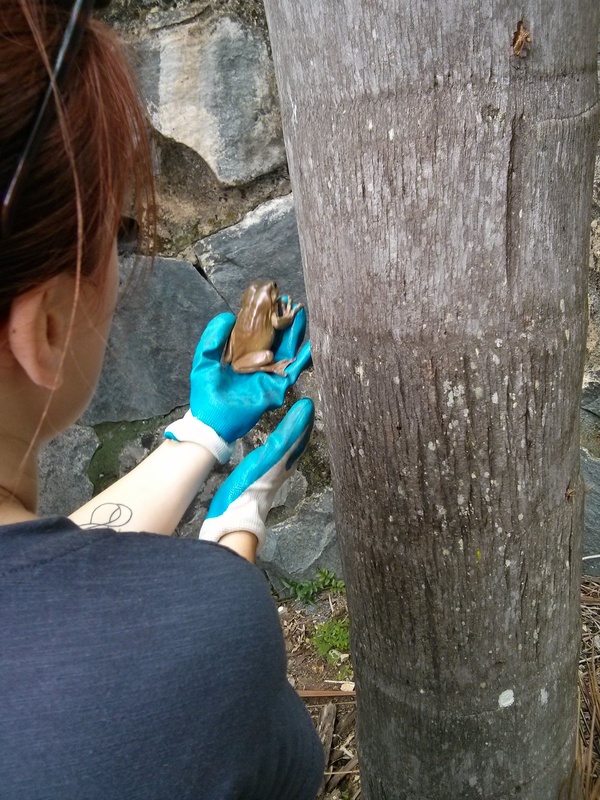 For a stretch of a few weeks, it seemed like every time we let the dog out, he would find a cane toad, and interact with it in a way that left him “exposed to it’s toxic effects”. Arkie – risking his life for a cheap thrill. 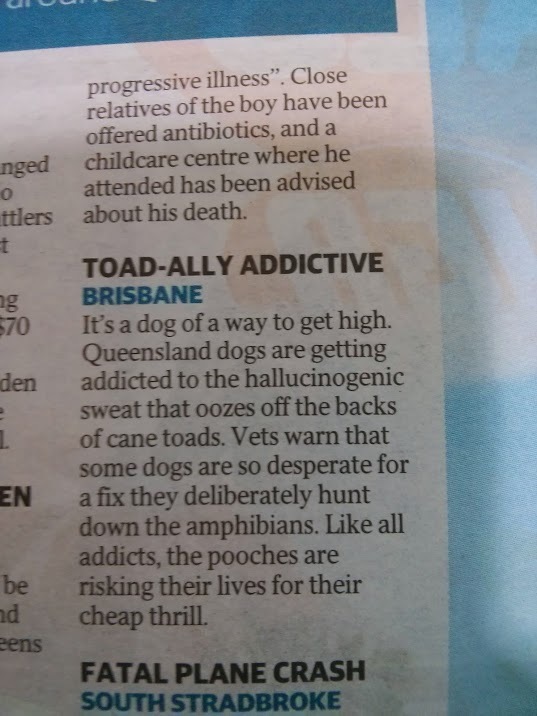 Seriously, though – Cane toads are a HUGE problem. This was pretty interesting to see their progress – even from 1940 – 1980. As we mark one year in Australia I stare up at the ceiling before I go to bed and think of the words I use nearly all the time. My parents have come to visit from Canada, and I notice the differences in vocabulary a lot more. It is a coping mechanism, to use slang as much as possible. I still say things from time to time that most people in my life (here) think are weird. A recent example – a friend wanted me to bring a “jug” to a barbeque so that she could make juice. In Canada we would call it a pitcher. Driving home, I asked for the pitcher back, and she had no idea what I was talking about, and her and another friend started laughing. They laughed at the use of pitcher, but not at the left over label on the jug / pitcher “Jesus Juice” (from a party before we left Canada – sometimes I think I am pretty funny / clever). Also – we found a tree frog hiding in the boot / trunk of our wagon/suv. 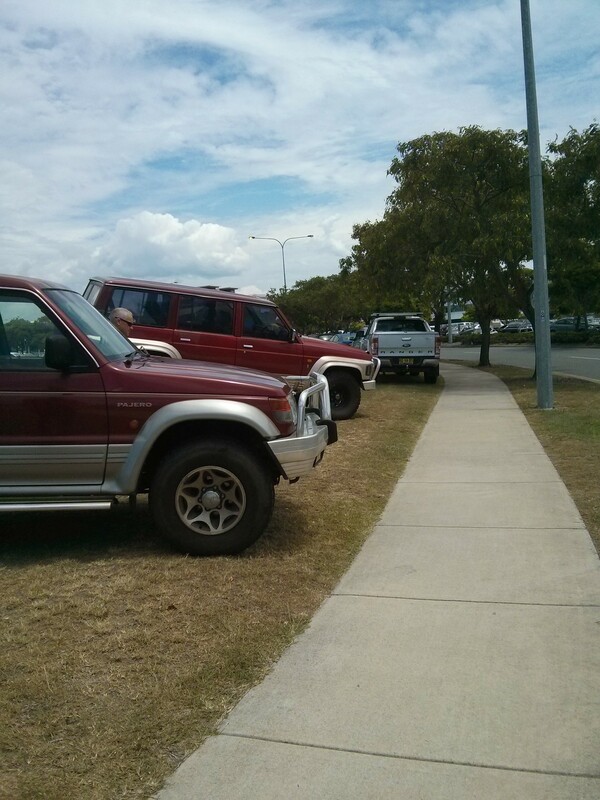 This, of course, was after driving about 25 km to pick up my parents at the airport. 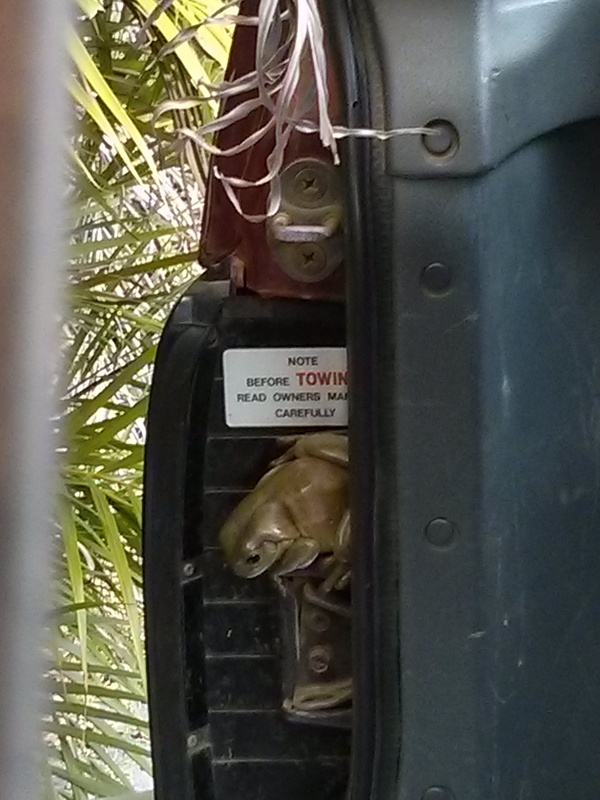 There is nowhere to put a fist sized tree frog when you are in the middle of a car park/parking lot. The frog managed to survive the return trip, and I was able to get him out of the wagon – remembering that human skin is generally not very good for frogs, I grabbed my gardening gloves first. It looked like he was ok. Surprise ! I’m in your car ! 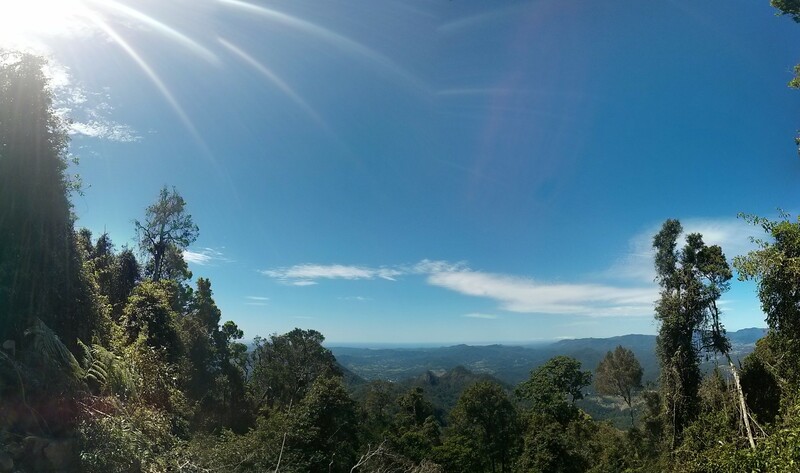 After a fairly consistent run of posting every other day, I stopped writing…here. I am currently working on another project with my pal, Kate – at Kath or Kate. As we find our footing on Kath or Kate, I think we are going to be working more with practical, DIY projects. At the present point in time we are focusing on the Holiday season – especially DIY crafts, and things for the home. As such, So Much to See and Do will remain my alter ego – the part of myself that cannot sit still, and will not spend more than 10 minutes in the kitchen or painting Christmas ornaments. As I get a bit older, and more settled, I’ve started to really enjoy the time I spend on creative projects – however, there still exists a restless 11 year old inside, that just wants to go and jump from activity to activity and see and do stuff. Easy Ways to Adultproof Your Home.